The pocket chainsaw is a foldable, portable saw useful for cutting wood and general cutting tasks while on the field, it folds to a very small size so you can include it in your kits without taking much space. The version we tested comes in a nylon pouch, it looks like bicycle chain with dents, it unfolds to about 27 inches length and it has two loops of paracord on each size to use as handles. We tested the saw cutting branches of pine trees in a field excursion; the branches were dead or fallen so no trees were damaged in our tests. The grip of the saw with just the paracord loops is problematic, you want to use it facing up because otherwise it will fold but that can be slightly dangerous so we ended using it facing up to start the cutting and then finish face down for extra safety. The saw cuts wood perfectly, in both directions without getting tangled. Mid sized pine branches were cut in 2 or 3 minutes without complications. 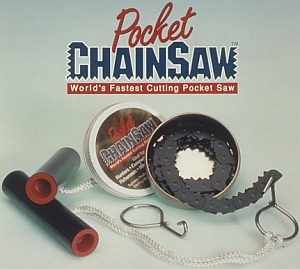 The pocket chainsaw is a very small item that can be helpful in many situations, for example to get some lumber if you want to make a nice fire for heating or cooking. If you are going to be outside is probably a must have in your kit. You can find more information about this brand of pocket chainsaws in this website or you can directly order one for $18 from EDCdepot.